I am not getting up at some crazy hour to post something about some rich people getting married, so I am posting this tonight. 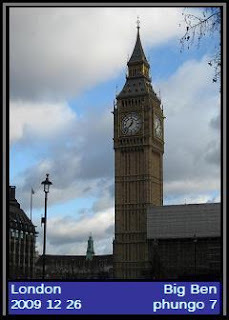 Big Ben is within sight of Westminster Abbey and is by my reckoning just to the right of where I was standing when this shot was taken. The photo was taken while ago on a vacation over Christmas break. I chose #7 for the card number as a nod to a certain NFL quarterback - even if I find the teams fans pretty annoying. Tough game for the Orioles on Sunday. They lost 6-3 in extras to the Yankees in a game which the O's could have won had a close call at the plate in the 9th gone the other way. Jake Arrietta settled down after a giving up a couple of runs on a Curtis Granderson homer in the first. New Yankee (and short time Phil) Freddy Garcia pitched very well shutting out the Orioles for 6 innings on 2 hits. The Yanks relief corps did not fare as well. First Joba Chamberlain gave up a 2 run dinger to Mark Reynolds and then Mariano Rivera had to come in for a four out save. 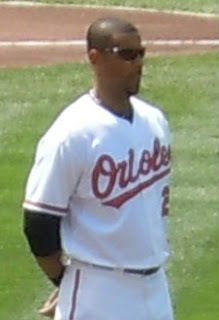 The Orioles were down 3-2 with two outs in the 9th when Brian Roberts batted with a pair of runners on base. 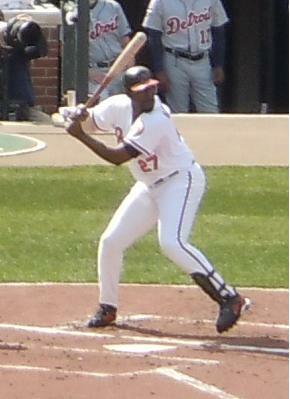 Roberts ripped a double down the Right Field Line plating the tying run and leading to a play at the plate. 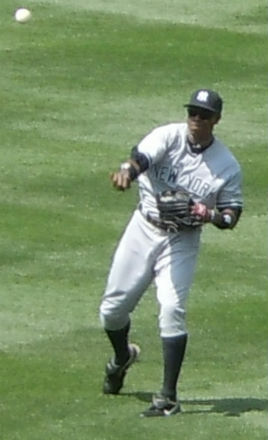 Fom my seat I thought that pinch runner Robert Andino was out, but on a replay it appeared that Yankees Catcher Russell Martin may not have gotten his glove down. Regardless the call made was an out. That play could have given the O's a 4-3 victory, but instead the game went to extras and the Yankees took a 6-3 win in 12 scoring a couple of those runs via some ugly Orioles fielding. 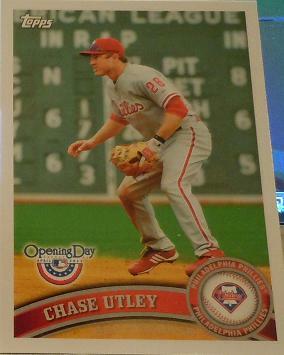 In Phungo Blog news, I have opened the potential "Hot Box" of 2011 Heritage. 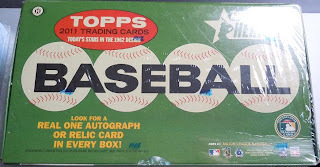 I will let you know that my research has found that the upside down topps logo box theory is......Urban Legend Only. My box was a "Not Box" - as in not a Hot Box. Which is a little disappointing but it was still a fun box to open and I am happy with the decision to build 2011 Heritage. Hopefully later this week or sometime next week I will get a synopsis of the box posted. Is this a Hot Box? I was on the fence about building 2011 Topps Heritage and while reviewing posts on the production, I cam across some interesting information over at A Cardboard Problem. While at a card show last weekend - (note: good CSA show at Oaks PA - maybe review eventually) - I noticed a case of Heritage Boxes being sold by a dealer. And I had to check. The upside down Topps Logo can see at the Bottom Right Side of the Red oval. This would be a rumored "Hot Box" - I checked in a stack of perhaps a dozen boxes of Heritage it was the only one box wrapped in the upside down cellophane. So I have Two Questions 1) Do you think this is a Hot Box and 2) Should I feel dirty for checking the stack to find this box? I figure I can say that I bought the box in the name of the all important research related to card collecting. This year Team Phungo introduced a special continuity series dedicated to retired numbers. The premier card in the series is dedicated to Jackie Robinson. Today Major League Baseball is recognizing Jackie Robinson whose number was retired across baseball on April 15th 1997. 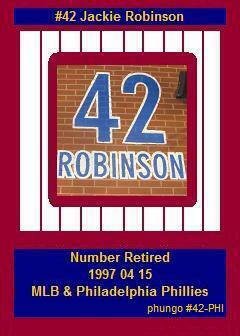 This is Robinson's Retired Number at the Phillies Home in Citizens Bank Park in Philadelphia. I am not sure of exactly what the Phils have planned tonight but I am looking forward to the activities as well as seeing players and teams don the 42 uniform number for a single unique game. CSA Card Show in Philadelphia -Burbs this Weekend - Free Admission on Friday! Collectors Showcase of America is bringing a card show to the Philadelphia Suburb of Oaks this weekend. The Oaks Expo center is just a few exits down 422 from where the Philly Show is hosted in Valley Forge. To my knowledge this is the first CSA show here since I have returned to collecting. The admission is Free on Friday with Show hours from 2-8. Saturday and Sunday there is a $5 cover w/ 3 free autograph guest each day. Time Permitting I will have more info up tomorrow. Regardless Team Phungo is planning to check out the show Saturday - if you might be attending let me know and I will look for you. The family of Robin Roberts has decided to sell much of the Hall of Famers Personal collection of Baseball Memorabilia. For more on the story check here at Philly.com. Hunt Auctions is handling the sale - some of the cooler items are game balls from several of the pitchers 285 Wins. Apparently the Phils catcher Stan Lopata would caption or decorate each of the baseballs. The Above ball is from 1952-07-02. That day Roberts and the Phils beat the Brooklyn Dodgers 4-3. The Dodgers lineup that Roberts defeated featured Jackie Robinson (who homered), Duke Snider, Roy Campanella, and Gil Hodges. The Phils ran out Richie Ashburn batting leadoff and playing center field. 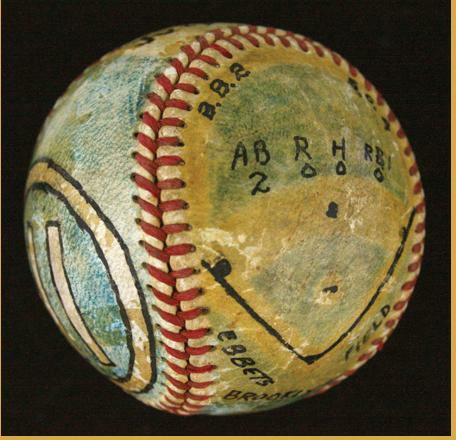 This Link will direct you to the above ball, from their you can navigate to see several of the other baseballs. As you likely know Borders Books is going out of business. I don't know if this sale is going on Nationwide but My local Borders had stuff at 80% off, nothing over $3. Most of the stuff was pretty picked over on Sunday, and there were long lines at the checkout. One thing you may want to look into is a Trading card price guide. regardless what you think about the prices in them, I believe they remain a useful tool for looking up cards and sets. At $3 they are a much better deal then the typical $30ish. The only one that the local Borders had was the SCD 2010 guide which had cards from 1981 forward. Beyond that they did have a fair amount of sports books - not a ton of baseball, but lots of football. CDs and Movies are also on sale, but you would have to dig pretty deep to find something you like. Magazines are almost a decent deal at 90% off - If you have never picked up a Baseball America and your a fan, this would be a cheap way to introduce yourself to the magazine. They were also selling bookshelves and other similar items. Those were priced according to size maybe $25 and up. 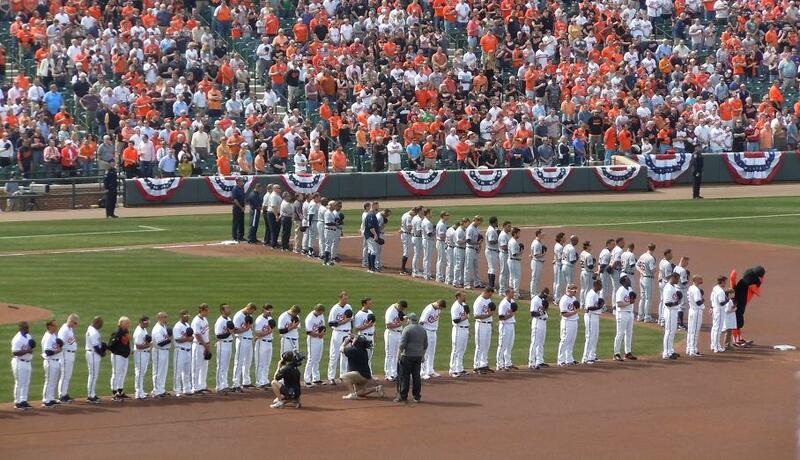 Monday was a perfect day featuring the Orioles and their perfect 3 and 0 Record. 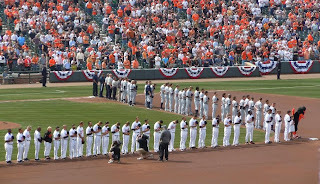 I may not go to another game this year that features the beautiful weather that the Orioles Home Opener did on Monday. The O's contributed to the great day by earning a 5-1 victory over Detroit behind a strong start by second year starter Jake Arrieta. 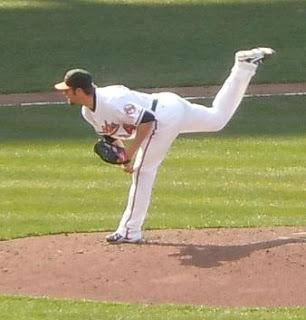 The 25 year old right-handed pitcher was the latest young Orioles starter to deliver a quality start as their pitching staff has given up a grand total of 4 runs though 4 games. Orioles Vet Brian Roberts provided the big offensive punch with a 3 run dinger in the 5th. The pregame highlights included a National Guard Fly-Over and a first pitch by Hall of Fame Manager Earl Weaver. 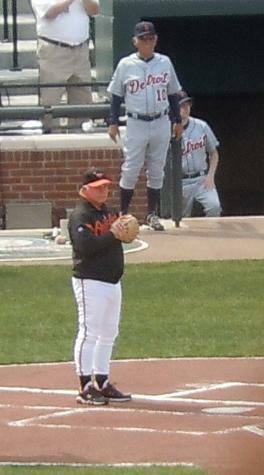 Baltimore's latest legend Buck Showalter with another Legend Jim Leyland in the background. Interesting shot - Cabrera at the plate, Victor Martinez who turned down the O's is on deck. Matt Weiters is behind the plate. Tigers manager Jim Leyland in the dugout. As I write this, the Phils are in the process of trying to avoid their first loss of the season while hosting the New York Mets. The Mets have gone through a few disappointing season the past years and hope to rebound in 2011. We have brought in Paul's Random Baseball Stuff to give us some info on the Mets 9. > to see different teams and visit new parks? > 3) Who will lead the Mets pitching staff in Wins? . > planning smaller events throughout the season. >> 5) How much did the Bernie Madoff Scandal cost you? 5 out of 5. Jason Bay is one of those guys I root for despite being a Met and Paul gave us some good info on what is happening with the Newark Bears - We here at Team Phungo HQ will be looking forward to his Can AM league postings. For a look back at a previous Phungo 5 featuring Capewood Collections discussing the Astros click Here. Our discussion with Paul's Random Baseball Stuff from last summer is here. Chase has been on the shelf all spring and is on the DL to start the season, perhaps posting his card for Pull of the month will help his rehab. I haven't really gotten around to posting about player collections here at Pbungo, but I do have a modest Chase Collection that I should get around to documenting at some point. I come down on the NO side of the Photoshopping new Unis on traded/moved players argument. Funny thing is I enjoy airbrushing. The trouble is that the P-shop cards have gotten to good for me to identify. This one I quickly noticed because the P-Shopped Yankee Martin. 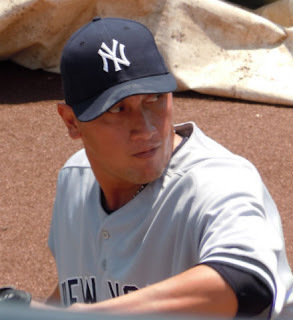 In the mythical world that Martin is playing in the Yankees are facing the Padres whom they haven't played since 2008 and those were home games - I am too lazy to figure out the last time the Yanks visited San Diego. 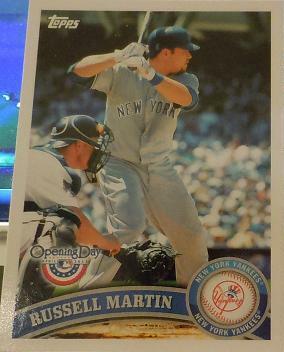 But I am pretty sure that Martin has never faced the Friars in a Yankees Uniform. The newer Topps Sets are loaded with action shots, I think headshots of the traded players would be fine, in fact I think the trading/signing press conference photos would make for decent cards. Regardless of what I think, it appears PhotoShopping is in for the moment and there will be plenty of this over the next few years.